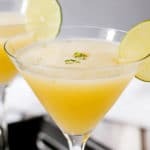 Add the vodka, basil, honey and passion fruit purée to a cocktail shaker. Muddle it well. Add a whole bunch of ice to the cocktail shaker. Add the lime juice and the egg white and shake really well. Divide into two martini glasses and serve!